MADISON, WisconsinThousands demonstrated here February 15 to protest Gov. Scott Walkers budget proposals. Vowing to get public workers into line, the governor plans to double health-care premiums to more than 12 percent of pay and make workers contribute almost 6 percent of their wages to cover pensions. The governor seeks to virtually end collective bargaining for 175,000 state employees. A rally of some 12,000 was held at the capitol at noon and a candlelight vigil brought out another 10,000 in the evening. Demonstrators came from as far away as Green Bay and Fond du Lac. High school students in Stoughton, Wisconsin, walked out of school February 14 to hold a rally denouncing the budget measures. Students at West High in Madison walked out the following day. 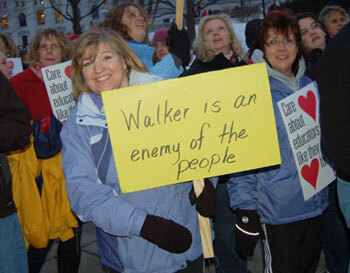 Governor Walker has threatened to use the National Guard against public workers if they go on strike.